This article is about Samus' appearance in Super Smash Bros. 4. For the character in other contexts, see Samus Aran. Samus (サムス, Samus) is a playable character in Super Smash Bros. 4. Her return to the series was confirmed in the E3 2013 trailers on June 11th, 2013, while she was also among the first wave of amiibo figures that are compatible with SSB4. However, unlike in Super Smash Bros. Brawl, Samus is no longer capable of transitioning into Zero Suit Samus, with the latter now becoming a standalone character. Samus is currently ranked 37th out of 55 on the tier list (tied with Robin), placing her at the bottom of D tier and middle of mid tier. This is a noticeable improvement over her bottom-tier placement in Brawl, where she was ranked 32nd out of 38. Samus possesses numerous projectiles in the form of her Charge Shot, Missile and Bomb, all of which grant her strong zoning potential alongside her Grapple Beam. Charge Shot also functions as a fearsome KOing option and a strong punishing option in many situations due to its high damage output and excellent knockback, while her Bomb and Grapple Beam can aid her recovery. Samus also possesses a good air game that allows for powerful and highly damaging combos when she finds or sets up an opening, which is further supplemented by set-ups in the form of her dash attack, up tilt, down aerial, down throw and Grapple Beam. However, Samus' moveset forces her to be reliant on defensive spacing to keep opponents at bay. Except for her down tilt, all of her moves are generally less effective at point-blank range, while they also render her prone to trading hits with opponents even at mid-range. When combined with her floatiness and average mobility, these traits can make it difficult for Samus to escape from juggling and other problematic situations. While Samus has noticeably improved since Brawl, largely due to game updates, most of her fellow veterans have also improved at varying degrees. This has resulted in her overall representation being poor (which is compounded by her very high learning curve), although she has attained a dedicated playerbase nevertheless. Thanks to the likes of professionals such as IcyMist, ESAM, KayJay, Afro Smash and Jonny Westside, Samus' results have continuously improved over time, most notably with IcyMist's 9th place finish at Royal Flush, Afro Smash's strong results in the United Kingdom, KayJay's 13th place finish at Smashdown World and ESAM's 1st place at Combo Breaker 2017. As a result, Samus' placement has notably risen with each iteration of the tier list, and many players label her as a solid character with the potential to rise even further. Samus is unique among her fellow heavyweights. While she is tied with Bowser Jr. as the sixth heaviest character in the game, she is a floaty character with slightly below average walking and dashing speeds, average air speed and slow falling speed. These attributes grant her an easier time chasing aerial opponents and forcing air dodges, yet also cause her to be juggled rather easily. When combined with her few reliable landing options and slow falling speed, opponents will also have more time to punish Samus as she attempts to return to the stage. In addition, many of her moves artificially extend her hurtboxes, leading to trades, an opponent grabbing her invisible hurtboxes and, in some cases, getting punished after landing a move despite her being visually out of range of the opponent's counterattack. Furthermore, some of the hitboxes on her moves, most notably up smash, forward smash and up aerial, have the issue of failing to connect properly or even whiffing outright. Samus' moveset is defensive, as she uses her projectiles to space, rack up damage from a distance and pressure shields. Charge Shot is her most consistent KOing option out of her special moves, courtesy of its increased speed and power. Missile is mostly used for spacing, due to neither its Homing or Super variants being extremely inefficient at KOing, while Bomb grants Samus various mix-ups and can aid her recovery. However, Missile and Bomb also possess valuable utility, in that they can guarantee a shield break when used in conjunction with a sufficiently charged Charge Shot or a sweetspotted back aerial. Lastly, Screw Attack is a decent out of shield option, a KOing option near the upper blast line and a viable combo finisher from aerial combo strings. Combined with rage, it can KO very early. In addition, Samus has a strong air game. All of Samus' aerials have no more than 20 frames of landing lag, and her back aerial is one of her best moves courtesy of its power, damage output, speed and range. Her down aerial can be a powerful meteor smash, forward aerial is a good pressuring tool due to its long duration, and up aerial is an excellent combo option. Lastly, her neutral aerial is a viable KOing option as of update 1.1.5. When coupled with her high jumps, Samus' air game is also potent while she is off-stage, as she can recover from nearly anywhere on the stage, stay in position for longer periods of time due to her floatiness, or bait the opponent by stalling in the air and punishing edge-guard attempts. Samus' grab game is also somewhat useful, as her Grapple Beam has impressive range, doubles as a tether recovery and has very little landing lag. Down throw is very useful for starting combos that deal respectable damage and can be used with her neutral, forward and up aerials at varying percentages. Many of her combos can rack up more than 30% and when using platforms to her advantage, or string together multiple times and then be finished with Screw Attack, leading to a KO or dealing 40%-50% at the very least. Lastly, her pummel is tied with Lucario's as the fastest in the game, although it is also the least damaging one. However, Samus is not flawless. While her grab range is among the longest in the game as with other tether grabs, the ending lag on all of Samus' grabs makes her very easy to punish if whiffed, and none of her throws can reliably KO on their own. Samus' ground game is mediocre overall as her smash attacks are punishable, with only her forward smash being a fairly reliable KOing option due to its quick start-up lag. Her neutral attack is very mediocre, which is noticeably exemplified in its inability to connect at high percentages and thus limits Samus' anti-pressuring ability. Her tilts can combo, KO, and have decent range, but suffer from her unique hurtbox issue. Due to this and her average dashing speed, most Samus players will often find themselves in the air, where her strengths lie. Samus also has slight issues with recovery. Her grab aerial has very long range, her jumps are among the highest in the game, Screw Attack is fast and hard to punish, and Bomb jumping provides infinite horizontal recovery, but they are all offset by Screw Attack's only average distance, Bomb's high ending lag in the air and Samus' only average air speed and reliance on her grab aerial to grab ledges from a distance. Altogether, this results in her recovery being linear and predictable. In regard to custom moves, Samus benefits from a few. Apex Screw Attack has slightly more start-up lag and the recovery it provides is slightly worse, but it deals more damage and outstanding knockback, to the point of KOing most middleweights at 75% from the stage and as low as 50% near the upper blast line. Screw Rush, while making her vertical recovery worse, grants more horizontal distance, deals more damage and KOs earlier then Screw Attack depending where it is used on-stage, making it more useful for damage racking. Relentless Missile, while traveling slower, has more accurate tracking as a homing missile while dealing less damage. Turbo Missile travels more distance and is considerably faster than both Missile and Relentless Missile, but at the cost of dealing less damage overall. Dense Charge Shot is dependent on the matchup and the player's playstyle. As one of the strongest projectiles in the game, it takes a bit longer to charge, and has much less speed and range. However, it gives Samus multiple set-ups due to the length of time the Charge Shot stays in the air and with the increased damage, can force shield breaks much easier and KO much easier. Slip Bomb, while dealing less damage, has the useful property of tripping grounded opponents and meteor smashing airborne opponents, making it useful as a set up for a grab or a punish and an edge-guarding option to spike the opponent. Mega Bomb can be used to stall opponents, since Samus can stay next to the Mega Bomb itself while waiting until it explodes, allowing Samus to either retreat, launch Missiles, charge her Charge Shot, or force an approach. Melee Charge Shot has a shorter charge time than both Charge Shot and Dense Charge shot, while also having considerably more hitstun and shieldstun with the inclusion of extra pushback after its use, making it extremely safe if shielded or even whiffed. Overall, Samus is a character that performs best when using her projectiles and grab aerial for spacing in order to set up combos and either finish off pressured opponents off-stage, or KO them outright with Charge Shot. Unlike the majority of veterans, Samus' optimal playstyle is highly unorthodox; as she falls short in regard to zoning-exclusive or melee-exclusive offense, success with Samus requires careful, calculated use of her various tools to keep momentum in her favor, much like in her home series. As such, she is like Shulk in that she is a character that is hard to master, but greatly rewards patient and calculated play. Samus has received a mix of buffs and nerfs in the transition from Brawl to SSB4, but has been buffed overall due to her buffs being more abundant and helpful. Samus has gained several new KOing options, the most notable of which is Charge Shot, which has drastically increased speed and knockback. The other noteworthy options include her forward smash, up smash, neutral aerial, forward aerial and Screw Attack. Forward smash now has a powerful sweetspot in the form of a fiery blast at the tip of her Arm Cannon. Neutral aerial, forward aerial, up smash and Screw Attack have each have had their knockback improved, most notably on neutral aerial (and only to the last hit in Screw Attack's case). Additionally, forward aerial, up smash and Screw Attack's multiple hits now connect better to further ensure that opponents cannot escape their respective last hits. Samus' dash attack is also capable of KOing due to its sweetspot having increased knockback growth, although it is not as viable in doing so as the aforementioned moves. Aside from her new KOing options, Samus benefits from the general changes between Brawl and SSB4. With the changes to hitstun canceling, Samus' combo game has been improved. Her attacks such as down throw and dash attack have been given better knockback angles, and she is able to combo attacks into each other far easier, with multiple combo starters and combo oriented moves, including dash attack, up tilt, forward aerial, up aerial and down aerial. Due to the overall higher fall speeds in the transition, Samus was given improvements to her falling speed, air speed, and gravity, which makes her aerial presence more threatening, giving her access to combos she never had before, and also allows her to land slightly easier than in Brawl. The changes to shields and shieldstun in update 1.1.1 also benefit her, as she can use her Charge Shot, Super Missile and Bomb in tandem with other moves to easily break shields. However, Samus also received a few nerfs in other areas during the initial. Her forward smash now has sightly increased ending lag as well as a new sourspot that is rather weak and runs along the Arm Cannon, while her up smash now deals less damage overall, though its knockback was heavily compensated, however. Likely due to receiving more KOing options, some of Samus' more reliable finishers in Brawl, such as her down tilt and down smash, can no longer KO until very high percents. Missile is harder to camp with due her losing the ability to perform her Missile Cancel technique, though her projectiles overall are still powerful and useful in their own right. Additionally, a few of Samus' most damaging attacks deal slightly less damage (though they still deal high damage relative to the cast), while her aerials have slightly more landing lag (though this is a universal nerf among the cast). Overall, Samus has been buffed overall from Brawl despite receiving a fair share of nerfs. She has been slightly re-balanced to be less reliant on projectiles, now wielding a slightly improved close-range game, with both her damage racking ability and combo game having been vastly improved. Most importantly, she has noticeably improved KOing potential, enabling her to score KOs much easier. While a few of her moves now require slightly more precision, such as her forward smash, neutral aerial and Missile, they compensate for this by being more rewarding. As such, she has a relatively high learning curve, but can be quite viable and versatile when mastered, similarly to Shulk. Dedicated players like IcyMist, ESAM, and Afro Smash have managed to bring her some degree of tournament success and continue to develop her metagame. 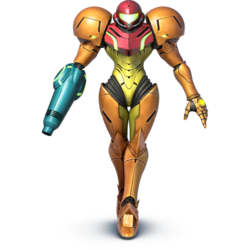 Samus' design is now based on her appearance in Metroid: Other M. Her updated design also incorporates numerous black vents within the Varia Suit's helmet, shoulder pads, torso and legs, while the suit's visor and accents are now emerald green, rather than lime green. Missile and Bomb have been very slightly updated with general graphical enhancements. Bomb is now red, rather than reddish orange. Dash's animation has changed. Samus now dashes like she does in Other M, rather than how she does in Metroid: Zero Mission, Super Metroid and Metroid Fusion. Samus walks faster (1.05 → 1.0615). Samus dashes faster (1.445 → 1.504). Samus' air speed is faster (0.987 → 1.03). Samus' falling speed is faster (1.07 → 1.3). Samus' fast falling speed is much faster (1.498 → 2.08). Samus' gravity is much higher (0.058 → 0.077). Samus is no longer connected to Zero Suit Samus via Final Smash, taunt, or menu input usage, with the latter becoming her own separate character. Neutral attack's second hit deals slightly more damage (7% → 8%) and has increased vertical range. Neutral attack's first hit has decreased hitstun and increased knockback growth. This allows opponents to shield the second hit or even be launched out of range for the second hit to land, hindering its utility. Forward tilt has adjusted hitbox properties. Its non-angled variant has received two sweetspots covering the lower leg and foot that deal more damage and received sourspots on her upper leg and body that deal the same damage as in Brawl (7%/8% → 7%/8%/9%/10%). Additionally, its upward and downward angles have each received a sweetspot on her foot that deals 1% more damage (10% → 11%). Lastly, it has increased knockback. Forward tilt's upward and downward angles have received sourspots covering her upper leg and body (10% → 8%/9%/10%). It also has slightly increased startup lag (frame 7 → 8). Down tilt deals 2% less damage (14% → 12%) and has decreased knockback growth (60 → 48), hindering its KO potential. Down tilt has slightly increased range. Dash attack has received an early hitbox that deals 7% and prevents point-blank whiffing. It also has adjusted hitbox timings and longer hitbox durations (frames 8-10 (clean)/11-16 (late) → 8-9 (early)/10-13 (clean)/14-18 (late)), decreased ending lag (IASA 38 → 34), improved knockback against aerial opponents. When coupled with the changes to hitstun canceling, these changes significantly improve its combo potential. Forward smash has received a sweetspot and a sourspot. The sweetspot is at the tip of the Arm Cannon and deals more damage (14%/13%/12% → 15%/14%/13.5%), while the sourspot is along the Arm Cannon and deals 1% less damage (14%/13%/12% → 13%/12%/11%). However, the sourspot is still stronger than her previous forward smash (20 (base)/100 (growth) → 16/112), making this negligible. Forward smash also has much greater reach because of the sweetspot, restoring its utility from Melee. Forward smash has increased ending lag (IASA 47 → 49). Up smash deals less damage (23% → 18%). Up smash's linking hits connect together better and the last hit has increased knockback, improving its KO potential. Down smash deals less damage (15% (front)/14% (back) → 10%/12%) and has decreased knockback (90 (base)/50 (growth) → 70/46 (front), 80 (base)/40 (growth) → 70/48 (back)), hindering its KO potential. Both hits also have shorter hitbox durations (frames 9-11 (front)/17-19 (back) → 9-10/17-18). Down smash has decreased ending lag (IASA 52 → 45) and it is now a semi-spike, granting it edge-guarding potential. All aerials' have increased landing lag (9 frames → 16 (neutral), 9 frames → 25 (forward), 12 frames → 18 (back) 9 frames → 12 (up), 9 frames → 20 (down)). Samus has a new neutral aerial, a spinning roundhouse kick. Compared to the previous neutral aerial, it deals more damage (9%/6% → 10%/9%/8%) and significantly more knockback, granting it KO potential. It also has much better range behind herself and launches at a lower angle, making it better at edgeguarding. Neutral aerial has more startup lag (frame 5 → 8), a much shorter duration, and significantly smaller hitboxes compared to the previous neutral aerial, hindering its range in front of her. Samus' faster falling speed removes forward aerial's ability to auto-cancel from a short hop and back aerial's ability to be used twice from a short hop. Additionally, its first four hits deal less damage (4% (hit 1)/3% (hits 2-4) → 3%/1.6%). Forward aerial has received a hitbox to make its hits connect together better. It also launches at the auto-link angle and its last hit has increased knockback, improving its edgeguarding potential. Back aerial's sourspot deals 2% more damage (10% → 12%) and its sweetspot has much higher damage and knockback, making it among the strongest back aerials in the game, improving its KO potential. Additionally, it has received a lingering sourspot that deals 9% and knockback that enables it to be used in a Wall of Pain, improving its utility. Up aerial's hits connect together better and its last hit has increased knockback, granting it KO potential near the upper blast line. It also has juggling potential now due to launching vertically instead of horizontally. Up aerial has significantly less edgeguarding ability due to its angle being changed. Down aerial has decreased start-up lag (frame 18 → 17). It also has spacing potential and much more KO potential because of its new sourspots. Down aerial deals less damage (15% → 10% (early)/14% (clean)/11% (late)) and it has received a sourspot along the edges of its arc that launches opponents horizontally. Grab aerial deals less damage (4% (early)/7% (clean) → 1%/3.5%). It also has 8 frames of landing lag, rather than auto-canceling. Grab aerial has increased range as a tether recovery. It also has received two additional hitboxes. All grabs have decreased start-up (frame 17 → 16 (standing/dash), frame 19 → 17 (pivot)) and ending lag (IASA 94 (standing)/74 (dash)/96 (pivot) → 69/67/83). All grabs' durations are 5 frames shorter. Pummel now always hits every fighter. This removes its ability to whiff. Up throw now deals full damage to all lightweights. Front floor attack deals 1% more damage (6% → 7%). Back floor attack and edge attack deal consistent damage (6%/8% → 7%). Fully charged Charge Shot has increased knockback growth (56 → 62), improving its KO potential. Charge Shot also charges slightly faster and travels significantly faster. Missiles have decreased startup lag (frame 20 (Homing)/23 (Super) → 18/21), longer durations (frames 18-116 (Homing)/21-82 (Super) → 18-118/21-84), and decreased ending lag on the ground (IASA 60 (both) → 57 (Homing)/59 (Super)). Super Missile also has increased base knockback (40 → 50), slightly improving its KO potential. Samus can only have two Homing Missiles and one Super Missile onscreen at the same time. If she attempts to shoot another one while one is already on-screen, she will perform the firing animation, but no Missile will be fired. Homing Missile also appears to target less reliably. Additionally, Missile covers less distance and Samus is no longer able to perform the Missile Cancel, hindering its utility. Screw Attack travels more vertical distance, improving its recovery potential, and its last hit has drastically increased knockback, granting it KO potential. Bomb has decreased knockback, improving its combo potential. It also has decreased ending lag (IASA 47 → 45). Additionally, aerial Bomb can be used faster. When coupled with her faster air speed, these changes improve its horizontal recovery potential. Aerial Bomb delays Samus' descent for a slightly shorter amount of time and Bomb grants slightly less height, hindering its vertical recovery potential. Additionally, Bomb's explosion is now absorbable. Zero Laser deals less damage overall. Zero Laser has less startup lag and more range. Zero Laser's animation has slightly changed. The beam now starts out thin before expanding, rather than starting out wide before thinning. It also produces slightly more prominent visual effects around the Arm Cannon's tip. Samus has been heavily buffed via game updates. She received plenty of significant buffs during game updates, along with two minor nerfs that were either negligible or even fixed outright in later updates, causing her to fare much better after the updates. In terms of direct changes, Samus started receiving relevant minor buffs in update 1.0.8. Said update saw her up smash buffed so that its hits can connect together better than before, while her grabs' ending lag was reduced, making them slightly safer. Update 1.1.1 bought about more minor buffs; Screw Attack was changed to help its hits connect together better. Her neutral and forward aerials were also slightly buffed, with neutral aerial having its hitbox sizes and timings improved, while forward aerial had its damage output increased and landing lag decreased. In terms of indirect changes, the changes to shield mechanics brought about by updates 1.1.0 and 1.1.1 are a mixed bag for Samus. The new mechanics gave Samus a number of new Charge Shot combos that allow her to break shields, of which she previously only had one such combo. However, these same changes also make most of her close-ranged attacks more difficult to land out of shield, while the only other moves that have been improved are her down tilt, her forward smash's sweetspot, up smash, and forward aerial, which are already difficult to land (or in up smash's case, requires the opponent to be above on a platform). However, update 1.1.5 has granted Samus arguably her most noteworthy buffs. Dash attack now has a hitbox that deals 7% at the beginning of the dash, which prevents it from whiffing and makes its hitbox timing virtually identical to Brawl. Forward tilt has been vastly improved; after being nerfed overall in update 1.0.6, all of its hitboxes now deal 2% more damage, its sourspot deals more knockback (thus making it safer and more rewarding upon landing) and its tech-chase combos have effectively been restored after they had been severely weakened to the point of necessitating its sweetspot for said combos to be performed. Like her forward tilt, her neutral aerial's hitboxes all deal 2% more damage, which naturally increases its knockback and improves its damage racking, KO potential, and shield safety. Although they are still unimpressive, her down smash and grabs had their ending lag decreased, making all of them safer and making her down smash a quick anti-pressure option. Bomb was also changed slightly, as Samus now gets more momentum out of one in the air. Lastly, Samus' attributes were also changed for the better. Her gravity, falling speed, and air speed were increased, which improve her already great survivability and allows her to land more effectively than before, which has been made even easier thanks to the aforementioned Bomb buff. As a result, Samus has been significantly buffed overall as of update 1.1.5, having become considerably better than she was in Brawl and even better than she was during SSB4's initial release. Sweetspotted forward tilt deals 1% more damage: 7%/8% → 8%/9% and its knockback increased, slightly improving its KO potential near the edge. Forward tilt deals 1% less damage: 6%/7% → 5%/6% and little to no hitstun due to receiving a sourspot on the middle part of Samus' leg. When coupled with the aforementioned sweetspot buff, forward tilt has lost its ability to lead into Charge Shot tech-chases, hindering its utility. Super Missile's speed increased, although it is rather negligible. Up smash improved. Its initial hits' hitbox sizes increased by 0.5u, its last hit's hitbox size increased: 7u/3.5u → 7.3u/4u and its last hit's knockback growth increased: 135 → 150. Standing and pivot grabs' ending lag decreased: 79 (standing)/92 (pivot) → 75/88. Neutral aerial improved. Its late second hit's knockback growth increased: 80 → 98, its hitboxes' sizes increased: 5.5u (hit 1)/3.5u (hit 2 clean)/2.8u (hit 2 late) → 6u/4u/3.3u and its hitboxes' durations increased by 2 frames. Neutral aerial's second hit's angle altered: Sakurai angle → 45°. Forward aerial's loop hits deal 0.6% more damage: 1% → 1.6%. Forward aerial's landing lag decreased: 30 frames → 24. Melee Charge Shot improved. It deals more damage: 5% (uncharged)/18% (fully charged) → 6%/20%, its partially charged base knockback increased: 30 → 50 and its fully charged hitbox sizes increased: 8u → 10u. Partially charged Melee Charge Shot's hitbox sizes decreased: 4u → 2.5u. Fully charged Melee Charge Shot's knockback altered: 65 (base)/35 (growth) → 70/32. Melee Charge Shot's recoil distance increased. Screw Attack's loop hits' weight-based knockback increased: 150/120 → 178/140. Screw Attack's loop hits' angles altered: 100° → 96°. Samus' air speed (0.95 → 1.03), falling speed (1.25 → 1.3), fast falling speed (2 → 2.08) and gravity (0.75 → 0.77) increased. Dash attack ending lag decreased by four frames (IASA 37 → 33). Dash attack has received a new 2 frame hitbox on frame 8 that deals 7%. This makes it no longer whiff at point-blank range. All of forward tilt's hitboxes deal 2% more damage (6%/7%/8%/9% → 8%/9%/10%/11%) and the sourspots have more base knockback (10 → 20), overriding the nerf in 1.0.6 and restoring its tech-chasing abilities. Down smash ending lag decreased by seven frames (IASA 52 → 45). Neutral aerial deals 2% more damage: 8%/6%/7% → 10%/8%/9%. The second hit of neutral aerial (late) has a larger hitbox size and z position: 3.3 (hitbox)/5.3/0 (z position) → 3.6/5.4/0. Forward aerial's angles have been altered, its hitboxes values have been extended, and its first hit has received a new hitbox that deals 3% to make it connect together better. All grabs have decreased ending lag by six frames each (75 (standing)/73 (dash)/89 (pivot) → 69/67/83. Homing Missile and Super Missile come out 2 frames earlier: (20/23 → 18/21). Super Missile's shooting duration is increased by 2 frames. Bombs give Samus more momentum in the air. Bomb crouch cancel frame decreased (IASA 47 → 45). Straight and Cannon Hammer 3% A left-handed jab followed by a forearm club with the Arm Cannon. The first hit can jab reset and jab cancel, but the attack is mediocre overall. Opponents can usually act out before the second hit connects by shielding or counterattacking, while the second hit may not even connect at high percentages. Depending on the opponent's weight, it is safe and a true combo ranging from 35%-75%, but only if the first hit connects relatively close to the arm and not at the fist. First hit comes out on frame 3, while the second hit comes out 6 frames later, meaning it is a much safer option overall to land the first hit and retreat. The second hit does have KO potential at very high percentages, however. 11% (foot), 10% (lower leg), 8% (upper leg), 9% (body) A reverse roundhouse kick. Deals more damage and knockback at her heel, while her leg deals less damage and knockback. Can be aimed at strong angles, though if angled up, it can actually miss medium-sized characters like Mario. Comes out on frame 8. The foot sweetspot deals rather potent knockback for a tilt attack, which can KO near the edge at around 150%. At varying percentages, such as from 30%-40% when sweetspotted and 100%-120% when sourspotted, it can lead into a guaranteed Charge Shot. This is because, regardless of teching, Charge Shot will catch their option in time. 13% (grounded), 12% (aerial) An axe kick, which is identical to Captain Falcon's up tilt. If an opponent is hit directly by her heel as it comes down, they are dealt extra damage. While the move can meteor smash, it oddly only does so on grounded targets, making it ineffective as an edge-guard. Samus' strongest tilt, it is able to KO grounded opponents at 140% or less with rage. However, it has noticeable start-up, due to coming out on frame 15. KOs aerial opponents at the edge around 90% or earlier depending on the opponent's weight. If the opponent misses their grounded tech, it is a good combo starter for her aerials at low to medium percentages, while it functions as a true combo into Charge Shot at high percentages. 12% Kneels and quickly thrusts her Arm Cannon downward to fire a small, fiery blast. It is very fast, due to coming out on frame 6, and deals respectable damage for a tilt attack. However, it has high ending lag and cannot KO until extremely high percentages. It is useful as a close range anti-pressure option on opponents in front of Samus, or as a punishment option. With maximum rage, it can KO middleweights at 150%. 7% (early), 10% (clean), 6% (late) A shoulder tackle. Deals less damage at its beginning and end. An excellent combo starter as of update 1.1.5, as it can lead into neutral, forward and up aerial or Screw Attack at a variety of percentages, depending on which hitbox connects. With high amounts of rage, this move forms the start of a two-hit KO combo into Screw Attack, which KOs due to only the first couple of hits of Screw Attack connecting. This combo can KO floaty characters beginning at 0%, and the heaviest characters beginning around 30%. 15% (blast), 13% (Arm Cannon) Quickly thrusts her Arm Cannon forward to fire a small, fiery blast. Despite the blast's appearance, the hitbox does not quite reach the end of the blast, and actually reaches slightly into the Arm Cannon's barrel. Despite this, the sweetspot relies heavily on spacing in order to land, as only the blast deals knockback strong enough to KO at 100% from center-stage. Conversely, the Arm Cannon itself KOs at 138%, which makes its overall functionality largely similar to Mario's forward smash. However, it is tied with Marth and Lucina's forward smashes as the fastest one in the game, due to coming out on frame 10. It can be angled like her forward tilt, with the upward angle dealing more damage and knockback, though it can typically miss as a result. The downward angle can hit edge hanging opponents, similarly to her down tilt. Cover Fire 3% (hits 1-4), 6% (hit 5), 18% (all hits connect) Fires five fiery blasts in an overhead arcing motion. True to its name, this move works best as an anti-air attack, as its multiple hits give a good amount of aerial protection. Conversely, it is unable to hit grounded opponents unless they are touching Samus. When reversed on the ground, it can poke and hit through shields. KOs at 115% uncharged and around 60%-70% when fully charged. 10% (front), 12% (back) A legsweep. A semi-spike, its speed is decent and provides protection against rolls and near edges. However, its power has been significantly toned down since Brawl, as it is now one of the weakest down smashes in the game. KOs at extremely high percentages, making it unreliable. However, its back hit deals more knockback, making it possible to KO at 150% with enough rage, while the front hit can set up an edge-guard. Its ending lag is relatively quick, however, making it more useful as a decent anti-pressure move and a punishment option against rolls due to its ability to hit behind Samus. 10% (hit 1), 9% (hit 2 clean), 8% (hit 2 late) A spinning roundhouse kick. Hits on both sides quickly and can auto-cancel with a short hopped fast fall. One of the strongest neutral aerials as of update 1.1.5, its first few frames deal very powerful knockback, which makes it a viable KOing option off-stage or near the edge. It is also a decent combo finisher. 3% (hit 1), 1.6% (hits 2-4), 5% (hit 5), 12.8% (all hits connect) Fires five fiery blasts in a slow, downward arcing motion. The first four hits drag opponents into the rest of the move, with the last hit carrying the entire attack's knockback. Samus' main aerial move for both combos and protection. Extremely useful as an edge get-up option or against air dodges due to its multiple hits, and using the move immediately after a short hop can hit opponents with the last hit before Samus lands again. As of update 1.1.5, the first hitbox of the move results in all of the move's hits connecting together much better than before, to the point that it functions as a true combo from down throw up to around 70%, or chain into itself at low percentages thanks to Samus' air speed having been increased in that same update. 14% (clean foot), 12% (clean leg), 9% (late) A back kick. It is fast and deals powerful knockback when sweetspotted, which makes it an excellent KOing option, especially while edge-guarding. However, it has a small hitbox like her neutral aerial. When sweetspotted, it is among the strongest back aerials in the game. When sourspotted, it can be used as a Wall of Pain. KOs under 100% and around 80% at the edge. 3% (hit 1), 1% (hits 2-5), 4% (hit 6), 11% (all hits connect) A diagonal corkscrew flying kick. Hits multiple times, though only the last hit deals moderate knockback. Unlike most multi-hitting attacks, the opponent can easily be launched before the move is complete if Samus does not follow the opponent's previous launch direction. Grounded opponents can be hit by the last hitbox if Samus lands while starting the move in the air, although it is difficult to do so. It is her fastest aerial, due to coming out on frame 5. Useful for landing, breaking some certain combos, and countering aerial approaches. Can be used as a follow-up after a dash attack, grounded up tilt, down aerial, or down throw, all of which can be followed up with another up aerial and/or can be finished off with a Screw Attack. On stages with platforms, it can even zero-to-death the entire cast when using a platform to extend the combo. 10% (early), 14% (clean), 11% (late) Swings her Arm Cannon in a downward arcing motion. Hitting with the move's trail will meteor smash opponents, while the sourspot on the edge of the move at the very start and end deals strong upward diagonal knockback. Auto-cancels from a short hop and is a relatively good combo starter. Grapple Beam 1.5% (early), 3% (clean) Fires the Grapple Beam. A useful spacing option due to having only 8 frames of landing lag from a short hop. It auto-cancels from a full hop and has impressive range, being the longest grab aerial in game. In addition to its recovery and spacing capabilities, it is good at setting up an opening for a dash attack, which Samus can then further capitalize on with combos. Grapple Beam — Fires the Grapple Beam. It has impressive range and is the longest tether grab in the game. However, it is tied with her Zero Suited form's grab as the second slowest in terms of ending lag, making it very punishable if missed. 1.2% A palm strike. The second fastest pummel in the game, beaten only by Lucario's. However, it is also the second least damaging one in the game, after Lucario's. 9% Twirls the opponent overhead, then flings them forward. Low knockback growth prevents it from KOing even the lightest of characters unless with rage at extremely high percentages. 8% Swings the opponent behind herself. Has even lower knockback growth than her forward throw. 1% (hits 1-5), 4% (throw) Hoists the opponent overhead and then blasts them upward. Can combo into Screw Attack or up aerial at 0% against heavyweights or fast-fallers, but it otherwise launches opponents too high for follow-ups. However, on a platform, it can zero-to-death the same characters when followed up by her up aerial and then Screw Attack. Like her forward and back throws, it possesses low knockback growth. 6% Swings the opponent high above her head, then slams them onto the ground. It can be reliably followed up with her neutral, forward and up aerials, Charge Shot and Screw Attack at low to medium percentages. 7% Swings her Arm Cannon in front of herself and then fires a blast behind herself. 7% Performs a low-level roundhouse kick. 5% Performs a shin kick in front of herself and then a back kick behind herself. 7% Performs a legsweep while climbing up. Default Charge Shot 3% (uncharged), 25% (fully charged) Charges a ball of energy and fires it. Unless the move is already charged, Samus will instantly fire the weakest shot if it is used in the air. Boasts excellent KO potential when fully charged, and is a useful intercepting move at a low charge. KOs at 70%-110% depending on rage and the opponent's weight and DI. Can be used to break shields if used in conjunction with her neutral attack, up or down tilts, aerials, Bomb and Super Missile. When using her forward tilt to launch the opponent into tumbling, it can set up a guaranteed combo into Charge Shot regardless of the opponent's tech option, as Charge Shot will always catch their tech direction. Custom 1 Dense Charge Shot 4% (uncharged), 27% (fully charged) The blast deals slightly more damage, more shield damage and considerably more knockback, making it even better for KOing and breaking shields. However, the charge time is increased by 30% and its ending lag after being fired is increased. The shots travel at extremely slow speeds, so much so that three uncharged shots can exist at once, even with the increased lag. As a result, this grants it edge-guarding potential, as it can be used to trap opponents and put them in a problematic position. Custom 2 Melee Charge Shot 6% (uncharged), 20% (fully charged) Fires a shotgun-style energy blast that only hits at point-blank range. Deals more damage when uncharged and takes less time to charge, but deals less damage when fully charged and it has more ending lag. It also deals a massive amount of shieldstun and hitstun, as well as pushing Samus back after being used, making it safe if whiffed or shielded. Default Missile 5% (Homing), 10% (Super) Fires a Missile, which homes in on the opponent. If the special button is tapped like a smash attack, Samus will instead fire a Super Missile, which travels in a straight line and deals more damage and knockback. Both variations deal low knockback, but can be used to break a shield if used in conjunction with a fully charged Charge Shot. Both Missile variations can also be used as set-ups by opening up an opportunity for a dash attack, grab aerial, or Charge Shot, while the Super variation sets up better for a true combo into a forward jumping Charge Shot at high percentages. The Homing variation is also useful for catching recoveries and forcing air dodges, which can open up punishment opportunities. Custom 1 Relentless Missile 3% (Homing), 12% (Super) Missiles are slower and weaker, but have significantly improved homing capabilities. Super Missiles cover less range, but are stronger and have increased KO potential. Only 2 total missiles can exist at once, and no more than 1 super missile. Custom 2 Turbo Missile 4% (Homing), 9% (Super) Upon being fired, the default Missiles lock onto the opponent's position before flying towards it in a straight line, while Super Missiles pause briefly before shooting forward at a high speed. Both variations deal slightly less damage, but are lightning quick (only one can exist at a time). Default Screw Attack 2% (grounded hit 1), 1% (grounded hits 2-11), 1% (aerial hits 1-12), 12% (all hits connect) Leaps upward to perform a high-speed somersault while discharging energy. Shoots upward if initiated from the ground, while it gains distance slower if started in the air. A useful out of shield option and deals good knockback that can KO around 100% while near the upper blast line. With high rage, certain setups are capable of landing only the initial high-knockback hit, forcing the opponent out of the rest of the move for an abnormally early KO. Custom 1 Screw Rush 2% (loop, 5 hits), 5% (last), 15% (all hits connect) Deals more damage and knockback, which grants it better KO potential. However, because it launches opponents horizontally, it only KOs reliably near the edge instead of near the upper blast line. It covers more horizontal distance (launching Samus forward diagonally-up on the ground and angled in the same manner in the air), but covers less vertical distance, making it less effective for recovery. Custom 2 Apex Screw Attack 2% (hit 1), 9% (grounded hit 2), 7% (aerial hit 2) Deals more damage (albeit less total damage)!and much more knockback, which grants it much better KO potential, to the point that it can KO as low as 50% near the upper blast line and without rage, depending on weight and DI. However, it only hits twice and covers significantly less horizontal distance. Default Bomb 4% (contact), 5% (explosion) Rolls into her Morph Ball form and drops a Bomb, which explodes after a set time. Useful for edge-guarding or to force an opponent to shield. Deals good shield damage, as it is able to break them if used with her up and down tilts or a fully charged Charge Shot. Good for punishing certain recoveries and also useful for punishing the 2 frame-long edge grab vulnerability if timed correctly. Like Link and Toon Link, Samus can use her Bomb to perform a bomb recovery. Custom 1 Slip Bomb 2.5% (grounded explosion), 3.5% (aerial explosion) Bombs deal slightly less damage, but trip grounded opponents and meteor smash aerial ones. This makes them useful for edge-guarding or as a set-up. These bombs fall a little quicker, but shoot vertically out of Samus to just about even things out. Custom 2 Mega Bomb 4% (contact), 9% (explosion) Only one Bomb is able to be dropped at a time (though Samus can still enter morph ball), but its explosion has a bigger radius and deals more damage and shield damage, making it better for breaking shields when used in conjunction with Samus' other moves. The bomb takes roughly 3 seconds to detonate, about twice as long as the other two variants. It is also more effective for bomb recoveries. It is based on the Power Bomb. Zero Laser 0.5% (fringe loop), 1.5% (main loop), 2.5% (fringe blast), 5.5% (main blast) Fires a very large, bluish white energy beam. The beam can be angled slightly up or slightly down. Arrives from a Save Station. Up taunt: Salutes vigorously with her left arm as her thrusters activate. Side taunt: Faces the screen and demonstrates her Arm Cannon's mechanics. Down taunt: Aims her Arm Cannon behind herself, then kneels while aiming it in front of herself. Rubs her Arm Cannon with one finger. Brings her Arm Cannon down and then pulls it back up. A flourished remix based on the jingle that plays when Samus Aran obtains an upgrade to her Power Suit or when a Metroid game is resumed from a Save Station. Fires multiple shots from her Arm Cannon while kneeling, then strikes a pose. The pose is based on her appearance on the cover of Metroid II: Return of Samus. Performs a reverse roundhouse kick, readies her Arm Cannon, then strikes a pose. Throws two punches, fires a shot from her Arm Cannon, then strikes a pose. The animation is similar to Mii Gunner's neutral attack, while the pose is based on her appearance on the cover of Super Metroid. Afro Smash - The best Samus player in Europe. Placed 9th at Albion 2 and 13th at Syndicate 2016. Ranked 3rd on the United Kingdom Smash 4 Power Rankings. ChoZox - One of the best Samus players in the United States. Placed 7th at Paragon Orlando 2015. ESAM - One of the two best Samus players in the world. He has wins over Ally, ANTi, Zenyou, Locus, NAKAT, and some ranked Florida players, such as Xaltis, with Samus. Notably won Combo Breaker 2017 using only Samus. H-Man - Ranked 19th on the Midwest Smash 4 Power Rankings. IcyMist - Wifi warrior who is considered the best Samus player in the world. She has wins over Dabuz, Elegant, Marss, Wrath, Captain L, and more. Placed 9th at Royal Flush, 13th at Super Smash Con 2018, and 33rd at GENESIS 5. Ranked 1st on the Wi-Fi Warrior Rank. Joker - The best Samus player in Mexico. 9th at Smash Factor 5. Parme - The best active Samus in Japan. Placed 7th at Sumabato 21 and 17th at Sumabato 19. Has wins over Sigma, Kuro, and Saiya. Pyreeze - One of the best Samus players in the United States, has wins over Elegant, Konga, KOSSismoss and more. Ranked 7th on the Western Washington Smash 4 Power Rankings. Wes - One of the best Samus players from the Tristate Area. Placed 13th at KTAR XIII and 33rd at SKTAR 4. YB - The best Samus player in Japan and a "Wi-Fi Warrior". Jonny Westside - The best Samus player in the world when he was active. Formerly ranked 17th on the SoCal Smash 4 Power Rankings. He has a win over Mr. ConCon. Went on a hiatus mid-2016. KayJay - The second best Samus player in Europe when he was active. Placed 13th at Smashdown World. Ranked 6th on the Austria Smash 4 Power Rankings. He has wins over Sodrek, Luigi player, Chimera, Anragon and more. Salem - He has wins over Saj, Ryo, Dyr, and Kome with Samus. Samus was initially considered to have improved from Brawl, due to the improvements to her KO potential, a trait she previously lacked in tournament play. However, it soon became clear the buffs to other bottom-tier characters, such as Mario, Captain Falcon and Link, had made them significantly better than her. When combined with glaring blind spots on her hitboxes, extended hurtboxes, and continued struggle to KO, Samus would later be considered one of the worst characters in the game. Despite the buffs gained in game updates, notably update 1.1.1, her poorly regarded status remained intact, with only a handful of dedicated mains, such as IcyMist, KayJay, Afro Smash and Jonny Westside, having a notable tournament impact. As such, she was ranked 51st on the first 4BR tier list, becoming a bottom-tier character. It was not until update 1.1.5 when Samus gained her most efficient buffs, which allowed her moveset to flow significantly better, improving her offense and eliminating the majority of her blindspots. This resulted in her achieving significantly better placements at tournaments, and benefitting from nerfs given to characters with preferable matchups against her, such as Bayonetta, Diddy Kong, Sheik and Zero Suit Samus. These traits saw Samus ranked 45th on the second tier list and placed in the low tier, eventually rosing to 41st on the third tier list, at the top of the low tier. Her more bountiful results have resulted in her becoming a more stable character, and has seen her rise to 37th on the fourth and current tier list, now a mid-tier character, sharing the spot with Robin. As such, she is considered a far more viable character after game updates, and significantly better than how she was in Brawl, with some smashers, such as ESAM and Dabuz, claim that a higher placement in the tier list is needed, despite her relatively below-average representation. Samus Aran has fought her way across a variety of planets in the Metroid series. She wears a Power Suit designed by the Chozo, giving her incredible versatility in a fight. She can wade in, but she favors beams and missiles. A fully charged Charge Shot packs a serious punch! The heroine of the Metroid series, Samus Aran. Her missions take her across the reaches of space, and her Power Suit gives her immeasurable fighting prowess. In this game, she uses a variety of ranged attacks based around beams and missiles. When her Charge Shot is fully charged, it can launch foes with devastating force. Samus protects herself from overhead enemies with her up smash, Cover Fire, which can land multiple hits on anyone it connects with. Samus also fires a homing missile by holding sideways and pressing the special- attack button or launches a Super Missile by quickly tapping sideways instead. Samus' up smash attack, Cover Fire, fires five small blasts overhead, making it great for countering incoming aerial attacks. Her Missile attack fires a homing missile if you hold sideways and then press the special button, but if you do these things at the same time, you'll fire a Super Missile. Samus unleashes a massive, long-range beam from her Arm Cannon as her Final Smash. Fighters on the edges of the beam will be drawn in, taking more and more damage. The sheer power of this weapon makes it tough to aim once it's firing, but it's possible to adjust the beam up and down. In Samus' Final Smash, she unleashes a huge laser beam from her Arm Cannon that draws opponents to the centre of the beam. Quite handy, since the closer they are to the centre, the more damage they'll take! You can also angle it up and down (albeit slowly), letting you catch more of your enemies and create more havoc. All-Star Battle: Regulars: Samus is one of the opponents fought in this event. All of the opponents are the eight starter characters of the "perfect-attendance crew" from Super Smash Bros. Galactic Avenger: Samus must defeat Dark Samus and Ridley in a Stamina Battle. Dark Samus has 150 HP on Easy/Normal and 180 HP on Hard. Identity Crisis: As Sheik and Zelda, the player must defeat Samus and Zero Suit Samus. Final Battle Team-Up: Samus, using her Dark Samus alternate costume, is one of the opponents the players must defeat. Poisonous Planet: Samus and Olimar must defeat two giant Charizard in a Stamina Battle before their own health is depleted due to being flowered. The Ultimate Battle: Two players select a character and must defeat the entire roster. Samus in the Nintendo Direct from April 8th, 2014. Samus' appearance during E3 2013. Using Charge Shot while a Bomb is nearby. Using Super Missile on Mario as Kirby crouches to avoid it. Using Zero Laser, her Final Smash. The second hit of her neutral attack. Using her neutral aerial alongside Link and Luigi. Crouching near a Steel Diver as Marth looks on. Samus and Bowser fighting on Arena Ferox. Alongside Peach and Wii Fit Trainer. Using her side taunt alongside Little Mac. Toon Link using the Gust Bellows on Samus. Zero Suit Samus and her Power Suit displaying their Jet Boots and thrusters, respectively. Samus and Link simultaneously grabbing an edge with their Grapple Beam and Clawshot tether recoveries. Samus fighting enemies in Smash Run. Samus displaying her new Light Suit-inspired alternate costume alongside Mario's new NES Open Tournament Golf-inspired alternate costume. Samus as she appears on the cover of Super Smash Bros. for Nintendo 3DS. This page was last edited on March 17, 2019, at 17:53.